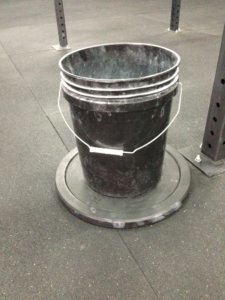 So many times I’ve seen somebody kick over a chalk bucket at the gym and spill the chalk all over the place. I’ve done it myself. It’s frustrating. Here’s an idea that really helps prevent that from happening (shout out to CrossFit Flagstaff for thinking of this and implementing it). 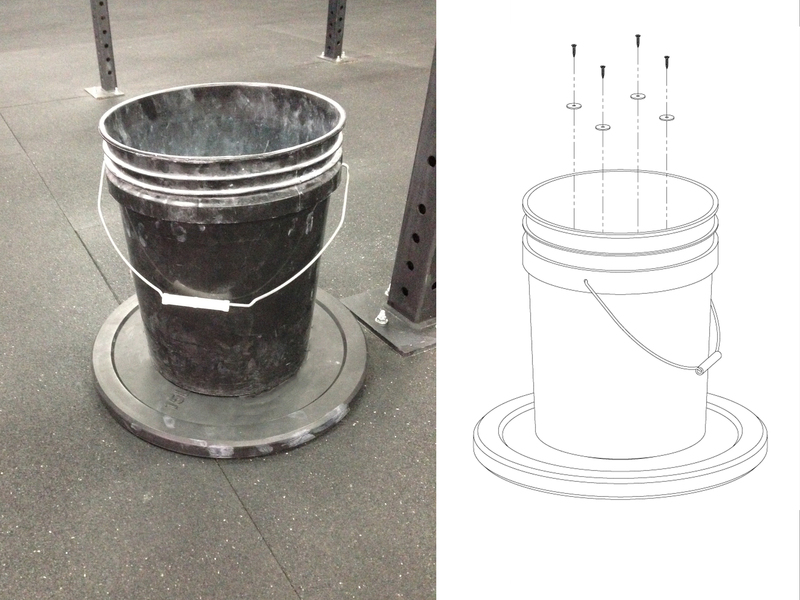 Add some ballast in the form of an old bumper plate to the bottom of the bucket to make it kick proof. This is a great way to re-purpose bumper plates that can’t be repaired. Of course, if the center bushing on your bumper plate is loose or missing, why not fix it with a repair kit and get it back into service? The images and illustration below are pretty self explanatory. Drill some small holes (large enough to clear a screw) through the bottom of the bucket. Attach the bucket to the bumper plate with some short deck screws or drywall screws. The screws need to be short enough not to protrude. There’s no need to pre-drill the bumper plate, the screws will go right in to the rubber without a pilot hole. 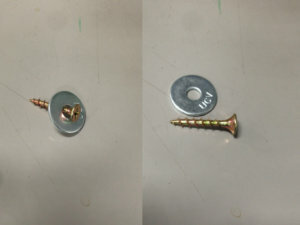 A fender washer will keep the screw from pulling through the bucket material. Order FringeSport bumper plates here.